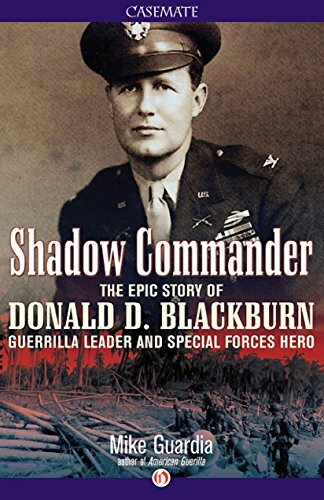 In Shadow Commander: The Epic Story of Donald D. Blackburn (Casemate Publishers), author Mike Guardia presents his readers with a memorable story of an underdog whose career was a testament to dogged determination and the will to stay alive. The true story of the US Army legend who organized “Blackburn’s Headhunters” against Japan in WWII and went on to initiate Special Forces operations in Vietnam. On the evening of April 9, 1942, the fires on Bataan burned with a primitive fury, illuminating white flags of surrender against the dark sky. Outnumbered and outgunned, remnants of the American-Philippine army surrendered to the forces of the Rising Sun. Yet US Army Captain Donald D. Blackburn refused to lay down his arms. With future Special Forces legend Russell Volckmann, Blackburn escaped to the jungles of North Luzon, raising a private army of 22,000 men against the Japanese. His organization of native tribes into guerrilla fighters would lead to the destruction of the enemy’s naval base at Aparri. But Blackburn’s remarkable accomplishments didn’t end with the victory in the Pacific. He played a key role in initiating Army Special Forces operations in Southeast Asia, became commander of the 77th Special Forces Group and later took command of the highly classified Studies and Observations Group (SOG), charged with performing secret missions. Blackburn also revitalized the Special Operations campaign in South Vietnam, conducting full-scale operations against the NVA and Viet Cong in Laos and Cambodia. Following his return to the US, Blackburn was the architect of the infamous Son Tay Prison Raid, the largest prisoner-of-war rescue mission—and, indeed, the largest Army Special Forces operation—of the Vietnam War. During a period when US troops in Southeast Asia faced guerrilla armies on every side, America had a superb covert commander of its own. This book follows Blackburn through both his youthful days of desperate combat and his time as a commander, imparting his lessons to the new ranks of Army Special Forces. An internationally-recognized author and military historian, Mike Guardia is also a veteran of the United States Army. He served six years on active duty as an Armor Officer. He is the author of the widely-acclaimed Hal Moore: A Soldier Once…and Always, the first-ever biography chronicling the life of Lieutenant General Harold G. Moore, whose leadership was popularized in the film We Were Soldiers starring Mel Gibson. As a lecturer, Mike Guardia has given presentations at the US Special Operations Command and the George Bush (41) Presidential Library. He holds a BA and MA in American History from the University of Houston and currently resides in Texas. Angela Kay Austin has always loved expressing herself creatively. An infatuation with music led to years playing several instruments, some better than others. A love for acting put her in front of a camera or two for her thirty seconds on camera before giving way to a degree and career in communications. After completing a second degree in marketing, Angela found herself combining her love for all things creative and worked in promotions and events for many years. The choice was to run for freedom or die never having been valued as a human — as a woman. The penalty was the same — death! Watson Brown knew all too well the struggle to survive. The fight to live. He had been given a second chance to do what he had failed to do in life — as a human. What he and his father could not do before the Harpers Ferry Raid. Angela dedicated this book to her mom who always supported her the whole way going to seminars and more with her. Her mother used to check out books for Angela before she had her own Memphis Library card. Q: Please tell us a brief blurb about Run For Freedom. Angela: RFF is a composite of many different things that interest me: history, love, and unlimited possibilities. I’ve never written historical, paranormal, or new adult. Without really attempting to I ended up crossing genres because of my interest in just following the possibilities. Q: What kind of research did you do in order to write this tale? Angela: I read a ton of history books on the American Civil War, weapons, slavery. I listened to a lot of recordings of freed slaves, as well as read some transcripts of freed slaves. I attended seminars on the American Civil War, too. It was all so amazing to learn. Q: Please tell us a little bit more about your mom. Was she a writer? Angela: My mother didn’t write, but when I was young she read different magazines and left them lying around. I picked them up. She encouraged me to never stop doing what I enjoyed and she told everyone she knew that her daughter was a writer 🙂 She even attended conferences with me and in my place, if I had conflicts. My mother was an absolutely amazingly selfless and giving woman. 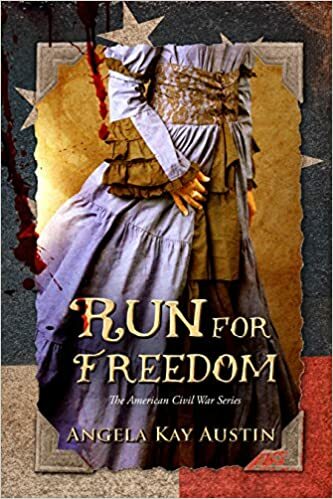 Q: Most school children were raised with “history” lessons about this time in America, what piqued your interest in the subject you wrote about in Run For Freedom? Angela: I’m from the south. I’ve seen remnants of the hate and segregation that divided my country, and I’ve always wanted to have the opportunity to be a part of the story of change. Q: Is this your regular genre? Angela: This is all new to me, and I like it. It crosses many lines: history, paranormal, interracial and new adult. Q: I notice that this is listed as the first book of a series – do you have ideas about the rest of the series? Anything you want to share? Q: Is there anything you want to say about Fiona Jayde (Illustrator) and Leonore Elliot (editor)? Q: Thank you so much for taking the time to join us here today. Is there anything you would like to add? Angela: I hope that people will check out Run For Freedom. When I received the cover art, the first thing I wanted to do was share it with my mother. I think sharing it with readers around the globe, she will see it and smile! Download my author app TODAY for iOS or Android! Katherine has been let down by men before. Can she trust the man who captures her? 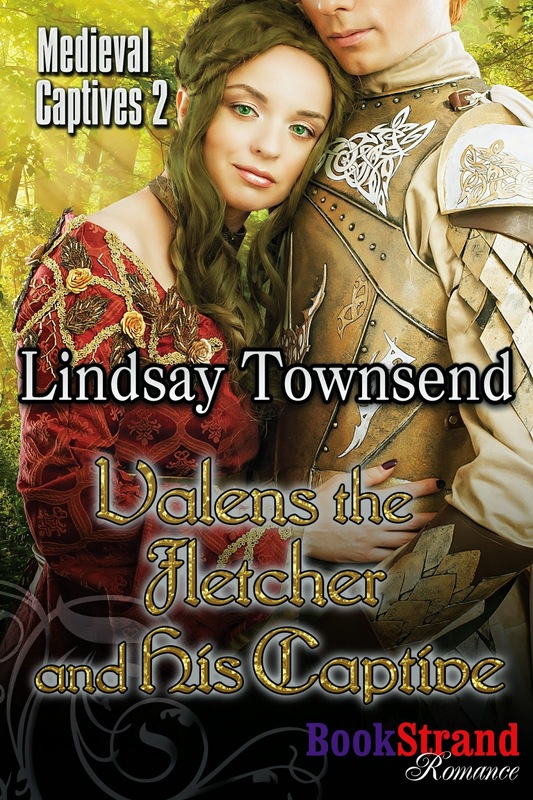 Valens the Fletcher and His Captive is book 2 of Lindsay’s Medieval Captives Series. 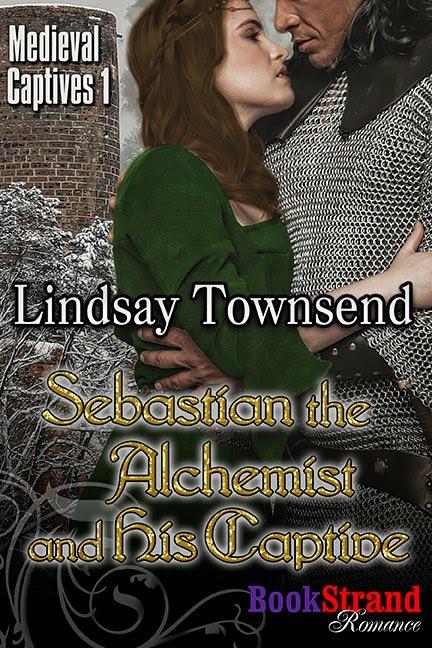 Book 1, Sebastian the Alchemist and his Captive, is already out. He takes her for hate. Will he keep her for love? Sebastian, lord of the tower in the northern high lands, is a proud, bitter man with a dark past. An alchemist and a warrior, he has had lovers but knows he is ugly—experience and betrayal have taught him that. When Melissa, the beautiful, neglected daughter of two old enemies, falls into his possessive hands he is determined to hold her. Why? As one of the detested and defeated Felix family, Melissa must cling to her courage when she is claimed as a war-prize by the tall, grim Sebastian. Expecting torture and ravishment, she finds instead a peace and sanctuary that she has never known. Treated with kindness for the first time in her life, Melissa begins to blossom. For months Lord Arik has been trying to find the precise spell to rescue his wife, Rebeka, but the druid knight will soon discover that reaching her four hundred years in the future is the easiest part of his quest. She took another step and past the stone marker. The air chilled and the sky turned an array of colors. Everything around her began to swirl. She realized her mistake too late. The portal, she was in the portal. Arik. Close to him now, she reached for him but her hand passed through the form. She examined her hand turning it over then spotted the shadow of the man. The shadow turned towards her. She watched as the wind washed over his face and it changed. “Bran,” she whispered in disbelief. Her head swiveled while she searched for something, anything to grab on to. The portal had one use and she had no intention of leaving. Get out, her brain shouted. His lips twisted into a cynical sneer. He tilted his head in jaunty satisfaction, snapped his fingers and vanished. “No,” she yelled. “Arik,” she closed her eyes and screamed in her head trying to mind touch him while the wind tore at her. Her eyes snapped open. She shielded them from the dust and debris and stared at Arik on the other side of the opening. He stood at the high plateau, miles away. His hands were braced on the opening’s edges, which were nothing more than solid streams of whirling wind. He struggled to keep the portal from closing. “Come.” His voice didn’t allow for any argument. The wind whipped at her, pushed her back. She tried again. “I can’t. The wind. Keeps. Pushing. Me. Away.” She shoved her staff in front of her and anchored it in the ground. Against the gusting wind, pulled herself towards him. “A little more, Beka.” He gripped the edge of the portal with one hand and stretched the other out to her. She shoved her hand towards him as far as she could. The tips of their fingers brushed. In a burst of effort he caught the top of her hand, a precarious hold. With a tight grasp she wrapped her fingers around his thumb. Safe, she wasn’t far now. She concentrated on his face. The corners of his mouth turned up as he pulled her towards safety. The wind grew stronger buffeting around them then changed its path. Before she could brace herself for the new direction, the gust blasted them. Without a firm grip, her hand began to slip. She pushed through the building panic. His smile slipped. The expression on his face turned to determination. Again her hand slipped until he held her by her fingertips. He held them fast—crushing them but that didn’t matter. He had to hold on to her. Every muscle strained. Inch by inch he brought her closer to him. She tried to help him the best way she could. Anchored to the edge of the portal, Arik encouraged her on. But his alternatives were limited. The closer she got to him, the stronger the gale blew. Just a little closer, that’s all she needed for Arik to grab her and get her out of the portal. The wind exploded from another direction. The blasting gale pushed her staff away from the opening, across the dirt, cutting an ugly scar in the ground and dragging her away with her staff. Ruth A. Casie writes contemporary and historical fantasy romance for Carina Press, Harlequin and Timeless Scribes Publishing. Formerly from Brooklyn, New York, she lives in New Jersey with her very supportive husband Paul. When not writing you can find Ruth reading, cooking, doing Sudoku, or counted cross stitch. Ruth and Paul have three grown children and two grandchildren. They all thrive on spending time together. It’s certainly a lively dinner table and they wouldn’t change it for the world. She loves to hear from readers, so drop her a line at Ruth@RuthACasie.com OR visit her on Facebook: www.facebook.com/RuthACasie or on Twitter: @RuthACasie. If you’d like to receive her occasional newsletter, please sign up at http://www.RuthACasie.com.For more information about Ruth’s books, please visit www.RuthACasie.com. Can there ever be a happy future together for the humble dancer and the brave Egyptian soldier who is so much more than he seems? Best Selling Science Fiction & Paranormal Romance author Veronica Scott grew up in a house with a library full of books as its heart, and when she ran out of things to read, she started writing her own stories. Married young to her high school sweetheart then widowed, Veronica has two grown daughters, one young grandson and cats Keanu and Jake. Veronica’s life has taken many twists and turns, but she always makes time to keep reading and writing. Everything is good source material for the next novel or the one after that anyway, right? She’s been through earthquakes, tornadoes and near death experiences, although nothing is as stressful as meeting a book deadline. Always more stories to tell, new adventures to experience—Veronica’s personal motto is, “Never boring.” MISC FACTS ABOUT VERONICA Received a 2013 SFR Galaxy Award for her novel WRECK OF THE NEBULA DREAM. Proud recipient of the NASA Exceptional Service Medal but must hasten to add the honor was not for her romantic fiction! Veronica Scott has a talent for forming characters. Nima and Kamin meet while captives of an invading army. Nima is a dancer of talent but little note who has been taken and for a General to dance and possibly die for the foreign god. Kamin is an Egyptian who the savvy Nima instantly recognizes as a warrior. Her bravery and natural sympathy which leads her to offer him some much needed water forms a bond and together they escape. Scott takes us on a wild ride with the pair. Aided with the special magic and unique characteristics Scott grants them they have strange experiences that fit perfectly with the well crafted plot. There was never a point where I said, “That shouldn’t or couldn’t happen” because though some of the plot points are not of this world Scott forms them in a way that could be believed of THAT world. 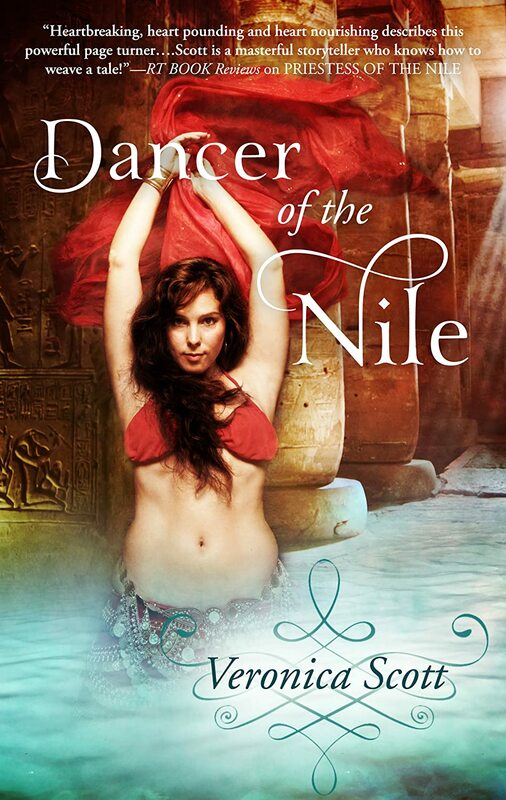 While not my favorite Scott book – an author for whom I am now a huge fangirl – I could not give “Dancer of the Nile” less than five stars. There is literally nothing wrong with this novel. Not a thing I would change. Loved every moment of this paranormal/historical romance. Pick it up today. 10% OFF TILL 6TH JAN! Sebastian settled back in his chair. He still had many petitions to read and tomorrow he would fight a duel, with mace and daggers, but for the rest of the evening…Yes, he could grant himself the time, the indulgence. Ignoring the dull ache in his lower back, he stretched his long arms above his head. “Robert.” He spoke quietly to the gangling chestnut-headed squire patrolling by the door. “Send the girl to me. Then get some rest before you fall over.” The youth had only lately recovered from a fever and even in the firelight looked as pale as the falling snow outside. “I will sleep when you do, my lord.” Robert gave a brief, jerky bow and slipped from the stone chamber, his rapid footsteps fading in the vastness of the tower. Sebastian returned to his reading, making notes on the parchment, listening to the spit of the flames, and waiting. What will she be like? He had only caught a glimpse yesterday, when he had claimed her as his prize. The child of an old enemy and my first, unrequited love. What have her people told her about me? The door swung open, slowly at first and then in a rush, as if whoever was entering was determined not to be cowed. Headstrong, just like her mother. Amused, Sebastian rested the tip of his writing quill on the tabletop to watch an energetic, vivid figure hasten into the chamber. She took a step forward this time, halting exactly in the shadows cast between the torches and firelight so that her face and form remained hidden. Arrogant and stubborn, just like her father. A whip of irritation cracked down his spine. “Artos, guard,” he ordered the black wolf he had saved as a cub from a hunter’s trap. Artos yawned, stretched himself up from the rug by the fire, and trotted to the threshold. With widening eyes the girl studied the wolf as it began a steady pacing back and forth before the entrance. “Your shadow, then.” The girl swung round to face him. Her voice was low, cracking a little from nerves or disuse. “He is handsome.”Unlike you. The unspoken words filled the chamber like the apple-wood smoke. Sebastian pushed back his chair and strode toward his captive, circling his prize as she stood stiffly at attention, her head held perfectly straight, her hands clenched by her sides, half-hidden in her once gaudy, now tattered, green and gold robes. In the shifting alliances of these lush and rugged highlands her kindred had backed the wrong overlord and lost. In the scramble afterward between the northern princelings for booty and lands, Sebastian had been able to take the girl, claim her by right of revenge. Revenge. What a monster she must think me, this dainty youngster, to make her pay for ancient hurts her father wreaked on me, for the old betrayals of her mother. Does she even know that pitiful tale? He circled her again, sensing her quiver as he loomed. She was a brunette, but there all similarity between them ended. 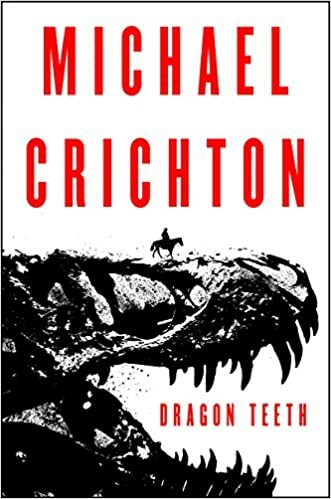 Where he was tall and lean and intense, large-jointed and craggy, precise from years of deliberate, often hard-won control, this tiny girl shimmered like a flame. Where his hair was black, dull and fine as silk, hanging straight to his broad shoulders, hers was the color of brimstone and treacle, long, heavy ropes of shining curling waves, sunset brown shot through with chestnut. Her father’s coloring, and wasn’t Baldwin always aware of his good looks? As for her mother in her—Sebastian halted before the girl and, with a long finger, tipped up her chin, glimpsing a pair of bright brown eyes in a freckled, delicate face. The child shifted, lowering her head in a gesture of apparent submission. The shape of her eyes are the same as Rosemond’s, but not the color. Her mother had blue eyes and gold hair and smiled like a Madonna, all the better to beguile men. He scowled at her address, disliking the arrogant assumption behind it that only knights had value. Just like her father. “I am no knight, girl, remember that,” he barked. She trembled and he could not decide if that was due to fear or revulsion. Watching the pretty glow drop from her face like a fallen ribbon, he decided it was both. Irritated and a little ashamed with his behavior, he closed his eyes, desperately trying to entomb his own past within himself. “Who would care for such a lanky thing as you?” His mother had first told him that. “Sallow, dark, possessive,” a previous lover or two had complained, before each one had parted with him due to his jealousy. “An ugly, crook-nosed brute…” Sebastian remembered that description only too clearly, the taunts “ugly” and “crook-nose” following him throughout his service as a page, then squire, before he had turned his back on the cruel, glittering world of chivalry. And who had first called him ugly and crook-nosed? Baldwin of course, this girl’s father, jibing and taunting, bullying and tormenting, setting on him with his friends and cronies, four, five, six against one. Sebastian had stomached that but then worse followed—he had heard Rosemond agreeing with Baldwin, the pair laughing together, laughing at him. After all I did for her and tried to do for her, after I helped her, after I told her I loved her. Strange after all these years that it should still ache so much, as if an anvil had been hurled into his chest. Fighting the despair, Sebastian growled like Artos and shook his head to clear it. Here he was, aged three and thirty, still re-fighting old battles, old hurts. I am pathetic. He opened his eyes, relaxing his grip on the quill before he shattered it.